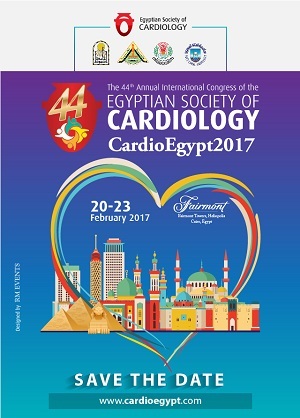 The Egyptian Society of Cardiology and the Cardiology Departments in Assiut, Banha, Mansoura & Suez Canal Universities have the honor to invite you to CardioEgypt 2017, the largest most comprehensive Annual Cardiovascular Congress in Egypt, the Middle East and Africa that will be held at Fairmont Heliopolis hotel during the period from 20th – 23rd February 2017. CardioEgypt 2017 is planned to be running in the following parallel tracks: Cardiac Interventions Track: where top interventional cardiologists will be there in several live transmissions, live in a box cases & challenging cases. The General Cardiology Track: where the latest data in hypertensions, heart failure, dyslipidemia and thrombosis in addition to sessions discussing the heart and its relation with the liver, kidney, DM and other systemic diseases presented by the most active international societies. The Imaging Track: discussing the latest in Echocardiography, nuclear imaging, multidetector cardiac CT and CMR. The Fundamentals in Cardiology Track: where the basics in clinical examination, ECG, echocardiography, MSCT, CMR will be discussed. The Cardiac Rhythm Management & Pediatric Cardiology interventions have a comprehensive program discussing the challenges in diagnosis and management. The Tech/nurse sessions will take place on Thursday with sessions dedicated to their role during different coronary and structural heart disease interventions and in the CCU. Several “hands on” and “how to” workshops are designed to satisfy the growing needs of the young cardiologists. CardioEgypt 2017 is an opportunity to learn and share best practices, novel hands-on techniques, the latest guidelines, clinical trial results and the most recent achievements and innovations in cardiology. CardioEgypt 2017 is also an opportunity to engage with 5500 healthcare professionals throughout 4 days of scientific sessions covering all the cardiovascular topics. Sitting side-by-side with other renowned worldwide experts, you will be able to develop several relationships that will help your work for years to come. The program will be submitted to the European Board for Accreditation in Cardiology (EBAC). We hope you will find CardioEgypt 2017 a memorable experience between the most elegant scientific conferences in the next years.